To know and assess the mode of marketing process that followed by CJW as a Trust in handicrafts sector. Also to asses, as a Fair Trade Organization how CJW is rendering its services to the Community. To know how it is implementing its Vision, Mission, Objective, Ethical Guideline & Trade policy in the practical field. To assess how it’s Management Team is consisted and how they are running this organization, i.e. what is its operational process. To assess the market size of its various products. To make conclusion on the overall findings of the study. I have applied “Descriptive Research” to conducts the report. This includes the methods of data collection & the sources of the data or information of the research. ► Direct conversation with the heads of the department and executive officers. ► Observing the total environment. ► Informal discussion with honorable officials. The scope of this report is limited to overall description of the organization, its set-up, functions and performances. The Organization itself can be benefited by using this report in their decision making process as well analyzing their overall activities. Other similar type of organizations can be benefited from this report. Other existing and new Entrepreneurs can be encouraged. Might be use full to other researchers. Over all, this report will act as documentation on the proven tract of the history of CJW’s last 36 years journey in handicraft sector. 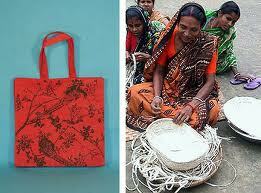 It can also prove the viability of handicraft business, in a Developing Country like Bangladesh. Caritas is Latin word. Literally it means “charity” or universal love. We prefer “LOVE” which includes all aspects of humanity. Caritas is Bangladeshi local, national, development organization, established by the Catholic Bishops’ Conference of Bangladesh, to carry out activities of integrated social welfare and development. Caritas is registered under the societies act XXI of 1860 number of 1972-73. Caritas has its National Office in Dhaka. There are seven Regional Offices in Barisal, Chittagong, Dhaka, Dinajpur, Khulna, Mymensingh and Rajshahi. In all these places Caritas is operational in Integrated Development, Disaster Management and Human Resource Development, under a Central management. The projects were concerned not only with providing the five basic human needs but sought above all to give employment by building a network of roads and therefore opening up communication in the isolated coastal areas. Government had determined that rehabilitation was to be carried out on a cooperative group basis for restoring agriculture. Caritas Bangladesh (CB) is a social arm of the Catholic Bishops’ Conference of Bangladesh to carry out the activities of social welfare and human development. The General Body is the highest policy making body of CB consisting of 31 members. The GB makes organisational policies, approves annual budget and audit, appoints auditors and elects the Executive Board. The Executive Board (EB) is a decision making body consisting of 12 members elected by the GB members. CORR-The Jute Works is a registered charitable marketing trust, under a board of trustees and one of the largest handicrafts exporters of handicraft sectors in Bangladesh. It is an organization of women handicraft producers that was established in September 2, 1973 to rehabilitate that war-widowed and war- affected poor rural women of Bangladesh. It is a non-profit woman’s marketing trust and exporter of Quality handicrafts. The organization was registered with the DEED No.-198, in October 17, 1981. The aim was to provide these women with work at home. CJW’s goal was not only to rehabilitate them, rather to extend them in sustainable development with their family. CORR- The jute Works was providing the means of income generation for these groups of women through producing handicraft items made out of a locally available raw material Jute and other such as grass, leaf, cane, bamboo, clay. During its last 36-years journey CJW was trying to upgrade the socioeconomic condition of poverty-stricken rural destitute women. The organization has its well-defined vision, mission, and philosophy. Now the organization has 19 production areas in the Country, all producing a diversified range of handmade jute, grass, leaf and terracotta products, which are being exported to different countries of Europe , America, Australia, Newsland and Asia. CORR – The Jute Works envisions the Empowerment & Dignity of the disadvantaged & marginalized; especially women, people with disability & indigenous people of the society in Bangladesh. Capacity building of the marginalized; especially women, people with disability & the indigenous people of the society in Bangladesh ensuring Trade Justice, market access & improved living standard. CORR-The Jute Works was founded and still run on the basic principles exposed by CARITAS-Bangladesh in all projects. CARITAS means love. Therefore, CJW is not merely a business in which members compete with each other for maximum profit. It reflects the compassion of Jesus Christ for the socially disadvantaged people of society and it seek the liberation and empowerment of women through organizes them together in groups for their self-reliant development. Society justice is the basis for the CJW. The maximum of the producers is its aim, rather than the accumulation of profit at their expenses. Therefore, CJW has been converted from its early orientation of being a rehabilitation project for war-widows to being a trust organization in which the members share the ownership, participate in decision making and receive the benefit of surplus production. The dedication and concern of the central business officers and workers is as important to the success of CJW as the labor contribution of the producers, who make the success of CJW possible. To promote & assist in the formation of handicraft producers as economically viable groups. To organize rural destitute women & provide them with skill education for producing handcrafts as a supplementary source of income for their socio-economic development. To promote thrift, self-help & democratic practices among the handicraft producer groups in the management of their affairs & to make them self-reliant by group action. To provide facilities for training to the artisans & employees of the Trust by coordinating with other agencies both at home & abroad in the interest of Trust & its beneficiaries. To participate in National & International fairs, workshops & seminars on handicrafts. To initiate welfare activities for poor people, such as housing, educational, recreational & healthcare facilities for better living conditions. To establish charitable & development funds for well being of poor artisan irrespective of caste, creed & race. The producers are organized in cooperative groups. They are fully autonomous in managing group affairs with the assistance of our Education team as required & follow the cooperative principles. At present, there are 140 groups with 3,524 producers in 19 districts of Bangladesh. In the field, volunteer supervision of production by group leaders & regular follow-up visits by the Education staffs ensure that the women receive a fair distribution of job orders. The producers make delivery the products timely & receive fair wages for their work. Problems in production, if any, are sorted out by the groups or reported to CJW to make up the anticipated shortage from another group. Job orders are given, according to the number of producers in the group & their skill. Producers learn how to save a portion to their earning on a regular basis for future gainful investment. Since the producers are the main concern of CJW, all its efforts & resources are gear to their needs & benefits. Shortage of time, due to stipulated time for three months, which is insufficient to conduct research and prepare the report on the big organization like CORR- The Jute Works. Obligation of the Organization to provide information which is seems to be very confidential. Since its inception in 1973, CORR-The Jute Works performed as a rehabilitation organ of Caritas Bangladesh (CORR) operating under a Management Committee. In 1981, it was registered as a Women’s Non-profit Marketing Trust with the first Board of Trustees comprising existing members of the Management Committee. The subsequent Board members were elected by producer groups. After completing a three-year term, the representatives of the artisan groups retired automatically from the committee. Then the election would be organized for the new representatives. As CJW export handicrafts, CJW ensure excellent quality, warn & smooth service, fair price & timely marketing. CJW has attached importance to the aspects of geographical, economical & cultural background export market. The customer has the right to know. CJW provides customer with adequate information regarding a product. Customer has the right to chose. Customers can take a closer look at samples & choose the products. Customer has the right to get products in the store. Customer has the right to be satisfied completely in dealings with the organization. CJW are determined to maintain good relations with customers. We believe in customers wrights to protection from unsafe products. CJW allows customers to be sure about the freshness of perishable & semi-perishable products. Over the years WFTO has developed the Code of practices for Fair Trade. The following principles & values characterize the core mission of “Fair Trade” organizations. 1. Creating opportunities for economically disadvantaged producers. 5. Payment of a fair price. To make people aware of arsenic poisoning, sources of arsenic contamination and the consequences of the same. To provide assistances for arsenic patients for proper treatment. To improve the existing living conditions, social security and human dignity of the shelter less/poor sheltered women/children led families by providing a complete house with a set of water sealed latrine on their own homesteads or on the lands donated by others. To aware the people for the minimization of loss of lives and reducing the damage of properties in disaster situations. To have the vulnerable people responded early for an impending disaster according to warning signals. To provide training on disaster management for volunteers, action groups, social workers, teachers, religious leaders and Union and Upazila disaster management committee members. To provide volunteers rescue equipment for responding the disaster efficiently. Caritas has implemented the following three projects in order to assist the fire affected families of Mohalchhari, Khagrachari. Distribution of Household Materials (Non-food items). Construction of Permanent Shelter and Essential Repairing Work of Damaged Homes (in two phases). Bamboo Fence Ceiling Works for the Improvement of Permanent Shelters. Caritas has completed the entire activities for the fire victims of Mohalchhari in two phases as mentioned below: (1) the first phase completed in the financial year 2003-04 with the construction of 33 permanent shelters (model-1) and the distribution of household materials. In the second phase, construction of 289 permanent shelters (model-2) and essential repairing works for 7 houses and the construction of bamboo fence ceiling for 275 permanent shelters were completed during the financial year 2004-05. A total amount of Tk. 28,656,491/- has been expended for the implementation of this project. Lent is the period of self-purification and for creating a greater awareness of the need to share what we have, not just from our surplus but from our own needs. TOSA is an annual campaign organised for creating awareness among the people, irrespective of caste and creed, for sharing with others. The funds collected through the campaign are used for supporting various development projects. Caritas Directors’ Discretionary Fund has been instituted to deal with small but urgent issues, for which normal procedures to obtain Executive Board’s permission cannot be followed. Caritas has not been able to get Donor’s support for this project. Therefore, Caritas General Body has allocated CB General Fund for the Discretionary Fund. The fund is utilized for purposes that are of short duration, such as seminars, training, individual cases that deserve charity, as well as minor proposals for experimentation and innovation. To express concern for the poor and destitute and assist our less fortunate brethren with our own voluntary monthly contributions. This program is for immediate help to the destitute helpless people of the society. Each staff member working under Caritas is serving the needy and poor people voluntarily by giving his/her own generous contribution in this project. It improves the livelihood condition of the poor people especially through its house repairing, income generation, marriages and other financial supports. This fund also creates an opportunity for the poor and meritorious students for going a step ahead for education. Marketing deals with identifying and meeting human and social needs. One of the shortest definitions of marketing is “meeting needs profitably”. Marketing as the process by which companies create value for customers and build strong customers relationships in order to capture value from customers in return. Consumers’ needs, wants, and demands are fulfilled through a marketing offering- some combination of products, services, information, or experiences offered to a market to satisfy a need, or want. Financial success often depends on marketing ability. Finance, operations, accounting, and other business functions will not really matter if there is no sufficient demand for products and services so the company can make a profit. Marketing people are involved in marketing 10 types of entities: goods, services, experiences, events, persons, places, properties, organizations, information, and ideas. Strategy of CORR- The Jute Works is aimed at meeting the needs of the buyers. The marketing activities or strategies of CJW have been developed on the following two broad steps. 1) Select the target market.2) Design a marketing mix (a combination of product, price distribution and promotion) that will satisfy the needs of the target. The primary objective of CJW’s development wing is to provide development stimulus in order to motivate the artisans to become self-supporting in production and management skills. CJW believes that the artisans are the major part of all activities and has given highest priority on the skill development of the artisans. Capacity building and skill development are related to many factors such as the artisan’s ability to meet the continually changing requirement of the buyers for a variety of handicrafts that are being produced by the rural artisans; as well as general awareness of the artisans on competitive export market, quality and contemporary development issues. – Distributing surplus earning among the organized groups for their development. Above all, we will work for a better and humane society, free from oppression, threat and injustice. Women are more organized oppression suppression. Core problems of various female issues are identified in the group meetings. Women’s involvement in socio development activities increased their status not only in family but everywhere. Women’s involvement in group activities increased their role in the family and in decision i.e. marriage, education, health and family expenditure. A tendency for late marriage can be observed among the youngsters and in the long run this will affect in population control. Women’s participation in various training programs increased their knowledge and skills. Women’s participation in various development programs side by side with the men is likely to develop a good gender relation. Many women earn good amount of money by involvement in various income generating work. As women are being involved in much income generating business, their dependency on husband and families also reduced. There has been some changing pattern in living standard. Savings attitude raised inside the group. Now women are playing vital role in the family affairs. Repayment of loan installment is done from their income. The designers of CJW develop new designs and accordingly samples are developed. Then the samples are sent to the different buyers abroad. From these samples, the buyers select their products and place order to CJW. Customer Services Section then processes the order for buyer and also forwards the order to the Production department. The Production Section distributes the orders among the producers. Raw materials are provided and often the artisans also buy those fro local sources. They have to produce the crafts according to the approved orders of the buyers. The figure shows the steps in the production and whole operation process. The production mostly takes place in the homes of individual artisans. There are three centers where the artisans work together under the supervision of the centers. Artisans bring back the finish products to the Quality Control Section. After checking the quality of the products, they are handed over to store for packing. Shipping Section prepares documents in two phases: pre shipment documents for having customs formalities at the origin. Then final shipment or final documents for the buyers concerning clearing of the consignment on arrival at its destination. The private sector handicraft (non-traditional items) exporter and related supportive business industries are very much rare but appreciable one of Bangladeshi handicrafts exporter, as it has the dominant and proud share in Bangladesh handicrafts export sector and also has internationally reputed results in success. The CORR-The Jute Works is the largest private sector Handicrafts export in Bangladesh, and doing the dominating business in Bangladesh. The product of CORR-The Jute Works has not only been supported its business, but also it is contributing more in the disadvantage & poor people as well NGO activities. CORR-The Jute Works export the handicrafts products to the aboard which help to earn the foreign currencies for our country. All the products are made by own producers who are living at rural area. The organizational goal is guided by Board of Trustees and Caritas-Bangladesh. The globalization challenge for further prospect and new competitor are considered in the study, and their impact on organizational culture has been tried to be focused in the report. It is difficult to judge the organizational culture of a large organization like CORR-The Jute Works within a short reporting period of time, so the study rather concentrated on various department and all other organizational side like Marketing, Administration and Human Resources, Information Technology, and Internal Control department, and considering the finance department as the centre for integration and practice of culture with other departments to achieve the organizational goal of CORR-The Jute Works. Jute plays a vital role in sustaining the cultural heritage of Bangladesh. This sector holds great potential in terms of outreach (geographical coverage and employment figures), contribution to the national economy and earnings from growing international market demand, particularly for jute diversified products. Jute used to be called the golden fiber of Bangladesh, as it was the height foreign exchange earner. More than 80% of the world’s jute was produced in Bangladesh. However India is now the world’s largest producer of jute as well as the largest consumer of jute products. But the importance of jute in the national economy of Bangladesh can hardly be ignored, as it is the third most important source of foreign exchange. Traditionally, jute has been used to manufacture rope, twine, carpet-backing cloth (CBC), Hessian etc. To compensate for the declining market for these conventional jute products, new technologies have been developed for the bulk use of jute as a raw material in the production of high value added price competitive intermediate and final products like CBC bag, macramé bag(made of jute twine), jute toy, jute decoration, jewelry made of jute, jute basket, table runner, hot plate mat, wall hanging etc. CORR-The Jute Works is one of the oldest organizations that work for the self-reliance of rural disadvantaged women including “adivashi” by making them enable to produce exportable quality jute products. CORR-The Jute Works is a non-profit organization. Any surplus after expenses is either returned to the producers, or channeled back into the organization as stock or utilized in Development/welfare projects for the rural producers groups. Export of the best quality handicrafts gives these women pride in their crafts, a chance to work in a co-operative-like village group, a position of respect in their family and society, a new awareness of the outside world, and above all a means of survival during difficult times. CORR-The Jute Works acts primarily as a marketing organization for it own producers. Furthermore, it also exports for other similar organization on a contract basis. These organizations are CONCERN Bangladesh, Young Women’s Christian Association (YWCA), Community Health Care Project (CHCP), Dhaka Handicrafts Ltd., Mennonite Central Committee (MCC), Mirpur Wheat Straw centre (MWC), Rishilpi Development Project and other groups at different times who wish to benefit from CJW facilities and experience in the field. Such organizations are charged a percentage for packaging, documentation and forwarding services up to shipment on board. This report shows my practical experience in CORR-The Jute Works. I acquired knowledge in many ways day-to-day operation for the complete on of this report. In this report, I have explained my best in respect of my real life experience gathered from different departments, particularly in the Information & Publication. As per the above analysis, it is determined that a large amount of taka was unutilized. Therefore, CJW could be more investment for the year 2010-2011. While implementing the marketing mix CJW had to face some of the vital problems last couple of years. As from January 2003 to July 2006 CJW was in transition period, shifting from its old own premise to a rented house (before shifting to CJW’s recently constructed own building). Lack of timely availability of reliable digital imaging equipments, which is essential for day to day Market Promotional activities. No new product catalogue was printed during 2008 & 2009. Marketing Policy & process were not properly updated, published and circulated to potential buyers. Few specific Market Promotional Buyers visit had been conducted in the past two years due to economic recession. CJW did not participate in last couple of years in Frankfort & Ambient trade fair in Germany as offered by Export Promotion Bureau (EPB). Thus CJW lost opportunity in attracting any new mainstream market customer. For outstanding performance and highest export of handicrafts, CJW had received the National Trophies (Gold) in 1975-76, 1977-78, 1981-82, 1988-89, 1990-91, 1995-96, 1996-97, 1997-98, 1998-99 and in 2000-01. This organization has been also awarded the prestigious award of the International Grand Prix for Commercial Quality EUROPE-88. These are great achievements of CORR- The Jute Works for producing and exporting handicraft products. CJW has skilled artisan groups and excellent business relation with buyers. CORR-The Jute Works is an organization of development and welfare of marginalized people. Delay in delivery of products in some cases, Wrong information from supplier and artisan at time, and Lack of up-to-date information on artisan groups. CJW has Faithful Alternative Trade Organization (ATO) Buyers. Non-delivery of raw materials on time by suppliers, their contact with other Organizations and Delivery of some sample to competitors. While analyzing the sales figure of last 20 years (from 1990 to 2009), due to unrest political and economical situation all over the world after the terrorist incident happened or September 2002 at New York’s, a big devastating impact is observed on handicraft Business also, besides other International Business Sector. After establishing in 1973, CJW became a self reliant project within 1976. Since then it is not dependent on its parent body CARITAS for any financial support. CJW is running and resources. Through managing the Organization’s working capital, developing capital budget and developing appropriate financial controls, the financial management is conducted by CORR- The Jute Works. Though the export situation in Handicraft Sector is showing a declining trend for last couple of years, but CJW managed to remain in the highest position in the Handicraft export sector by earning the foreign currency. To overcome the problems, CJW has taken some measures such as; they’ve shifted in their own building, taken initiative Market promotional package from last two years and getting good response/orders on the new samples. CJW is now working on new product’s Catalogue and after completion the work; it will be circulated to all customers immediately. Whenever any official goes abroad to attend seminar or fair on behalf of CJW, sufficient amount of samples and promotional materials should be carried for distribution to the prospective buyers. At the same time, specific market promotional visits to the buyer organizations of neighboring areas/countries need to be conducted. Through regular written circulation and seminar, training or workshop organized by the CJW education department, the producers should be made aware and motivated about the timely delivery of goods as per required quantity and quality. Many of CJW handicrafts items need to be produced in centre basis, which would be helpful to reduce the cost of transport, communication, quality, control, monitoring and can save the time, so as to make timely shipment. More Seminar, training and workshops need to organized for the grass rout level producers. The number of commercial buyer has to increase to survive in the long run. Lack of skilled marketing management exists. The variation of the product range should increase. It is needed to find more sources to collect raw materials and CBC coloring organizations. Need more skilled personnel in some particular departments. The artisan should be trained up more to produce quality product. Need to prevent the duplication of CJW products by competitors. Initiative has been taken to reconstruct the existing website within as early as possible and introduce E-commerce from the beginning of 2009. Printing of annual report, revised and updated price list, organizational profile and marketing policy are under process. The sooner CJW is able to circulate these promotional materials to their buyers, the better will be the sales performance of coming year. As CJW in the business of producing handicraft items, which are not essential commodity, during the unstable economic situation the market fluctuates frequently. Even then, CJW has to keep continuing its efforts to market the handcrafted products of the rural poor-artisans to help them increase their economic development, working skills leadership and make them self-reliant. Foundation of Financial Markets & Institutions.